Water is a basic need of humans but the supply worldwide is getting critical particularly in areas experiencing drought. The U.S. is not exempted and in fact, the drought being experienced by the country has prompted not just homeowners but as well as chefs and restaurants to find ways to save water. California is one state in the U.S. badly affected by drought for four straight years now. State officials have even called on residents to conserve water. The culinary sector, for its part, including food producers have also become more conscious of their use of water, how they shop and the foods they buy in the market. People are steaming more and are using fewer pots and pans while chefs and restaurants have made changes in their kitchen practices and even in the way they serve water to diners. Everyone should take action in saving water and this should start in the home. Even your small steps can already make a huge difference. In the kitchen, there are many ways to save water. 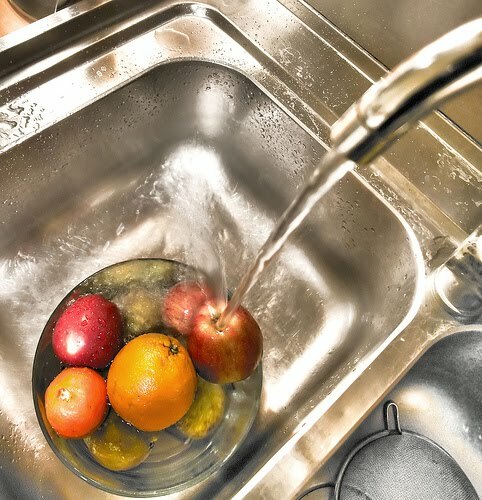 It is estimated that 10 percent of water used in a household goes to the kitchen. To conserve water one of the busiest parts of the house, check how you use your faucet first. Make sure that this is closed after every use and you open it just enough to release the right amount of water particularly when you’re rinsing dishes. Also, use less soap for fast and easy rinsing. Check that your faucet does not drip. If you see that it won’t stop dripping, change your washer or get the help of a plumber. If you are defrosting, a good option is to take out the food from the freezer and instead place them in the refrigerator overnight. Or you can defrost them using the microwave. You can also thaw frozen food by placing them outside your fridge at just room temperature. When cooking food, it’s best to steam not only to save water but to preserve nutrients. Check as well that you put the lid on to help boil water fast. You need not use a huge amount of water when cooking frozen veggies and stews. Did you know that using a pressure cooker can save you time, energy and yes, water? In cleaning pots and pans, a good idea is to soak them first in warm water to help soften the grease. This is a better option than letting water run on them while you’re scraping them clean. When washing dishes, always make it a point to fully load the dishwasher before turning it on. If you have only a few items to wash, better to wash them by hand. If you want to use your dishwasher, make sure that it is full because using it half-empty will only waste water.